The spine is a vitally important part of our body and influences our overall health and wellbeing. It provides structure, support, movement and it affects the communication between the brain and body. People often ask if there are ways for people to check themselves to see if they have an unhealthy spine. There are ways to get a general idea. This will not lead to a diagnosis; however, it will give you clear signs if you have an unhealthy spine. 1. 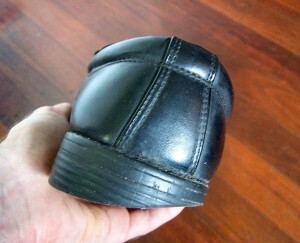 The soles/heels of your shoes wear out unevenly. This can be due to uneven leg length or stress along the length of the spine. 2. You can’t take a satisfying deep breath. Breathing, spinal health, and energy are all interrelated. 4. You have to “crack” your neck, back, or other joints often. This is your body telling you that something is out of alignment. 5. You can’t twist or turn your head or hips to either side easily and equally. Reduced or restricted ranges of motion are signs of a misaligned spine. 6. You have poor posture. Stand on two bathroom scales. The weight distribution should be about the same over each foot. If it is not, that’s a good sign that your spine, hips are off-center. 7. You have headaches, back aches, sore or tender spots in muscles or joints. All are common signs of a spine out of alignment. 8. You feel stiffness in your back or neck. Stiffness may be a sign of degenerative changes in your spine. 9. One leg appears shorter than the other. Keep your shoes on, and lie down. Have someone stand behind you, look down at your feet, and gently push your heels toward your head. Compare where the heels meet the shoes. One foot may appear anywhere from 1/8” to 1” shorter than the other. 10. You just don’t feel right, you’re in general poor health. If your nervous system is not in total balance, your health will not be in total balance. Little problems can balloon into bigger more complicated problems over time. So if any of these sound familiar, I encourage you to give me a call on 021 487 8465 or email me using this link. I will be more than happy to help. We at Chris Mee Group would like to extend our gratitude to Dr. Ben of The Wellness Champions Cork who very kindly took time out of his schedule to come out to our Little Island location to discuss the topic of Stress with our staff as part of our 2017 Workplace Wellbeing Day activities. As part of the talk Dr Ben gave some really great tips on minimising pressure and stress in the workplace. I would highly recommend that if you are part of a club/group that you contact the very helpful Siobhan at cork.mywellnesschampions.org to book a talk at your location! Thank you Catherine. You are most welcome, delighted to help. I loved being part of your Workplace Wellbeing Day. Thank you Catherine for your kind words. We were delighted to be part of your wellness event. Thank you for the invite!